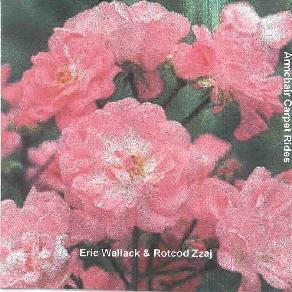 Eric Wallack & Rotcod Zzaj - "Armchair Carpet Rides"
Two underground greats come together for a free-improv toe-tapping mind-bending groove fest. Eric Wallack provided the source tracks playing acoustic guitars, Appalaichan dulcimer and Balilaika, and Rotcod Zzaj added his keyboard magic to create a Zzajalicious set of duo jams. One of the magical things about Zzaj's music is his ability to set a cool groove and even swing while simultaneously exploring the avant-garde and just plain strange. And Wallack quite ably steps up to plate playing his stringed instruments in a very Zzaj friendly manner. Among the highlights are "Ali Baba's Urban Vistas", "Gliding Through Gardens", and "Restless Roguery", all of which consist of avant Blues, a nice swingin feel and soloing from the duo that parallel each other quite nicely. "Danger Swirls" features the trademark Zzaj keyboards setting a steady rolling groove that would fit nicely on the MiWaPa Trio CD. Wallack plays in a slow measured free-improv style, but there's a marked contrast between the pace that the two are playing at that I'm not sure completely works. "Blue Sea" is similar but Zzaj plays at a pace that better matches Wallack, making this a much stronger tune and one in which the contrasts are apparent but gel together in a much nicer way. Lotsa cosmic grooves and interesting playing. "Wayward Wind & Wires" includes Zzaj keys that have a flute sound which I really dig. Kind of like a chorus of birds singing the Blues. "London Fogway" is another standout track. Wallack excels at finding that middle ground between the accessible and the avant-garde, and he kicks out a heartfelt jam on this tune making gorgeous use of dissonance that sounds so sweet against the cool Zzaj grooves. Finally, "Oriental Ghostriders" is an aptly titled tune that made me feel like I was experiencing a traditional Japanese tea ceremony in a Jazz club. One of my favorites and some very cool string work from Wallack. Overall a rollicking set that will appeal to free-improv groovers. Peruse the Zzaj Productions catalog at: http://www.homemademusic.com/~zzaj/.